Cut heights are more consistent, thanks to new, larger diameter discs that cut lower and at a reduced tilt angle. This combination of larger disc diameters and wider conditioning systems allows the crop to move rearward off the cutterbar sooner, improving crop flow and windrow consistency in tall crops. Fewer discs also means less horsepower is needed to run the mower conditioner. Case IH DC3 series mower conditioners are driven from the left side of the machine, delivering consistent power across all key functions. The swivel gearbox does not require a steering link, so the PTO shaft maintains perfect alignment. Both the roll and flail conditioning systems — at an industry-leading 3.175m (125 inch) width (2.59m – 102in on the DC102)— provide a best-in-class conditioning-to-cut width ratio. The result is a thinner crop mat passing through the system for consistently thorough crop conditioning. This wider system also allows for wider swaths, so more crop is exposed to the sun for better natural dry down. New, durable plastic cutterbar bi-fold doors offer improved quality and reliability, while still maintaining easy access to the cutterbar and its components. The poly, bi-fold upper shielding is lighter, provides easier access and is more damage-resistant. It minimizes damage if a shield is inadvertently left open. The all-new, cutterbar system has larger gears, bearings and interconnecting shafts for added durability. Plus the shock protection system protects the cutterbar from time-robbing, expensive field failures if an obstruction is encountered. The individual shock hub “takes the blow”, protecting the internal components of the cutterbar. 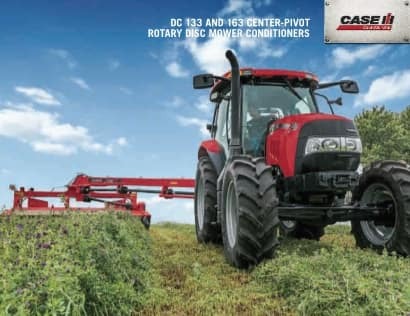 Achieve optimum dry down time in all crop conditions with Case IH rotary disc mower conditioners, designed with consistent, thorough conditioning in mind. With an effective torsion-bar roll-pressure design, the Case IH conditioning system applies equal force to the upper conditioning roll arms for uniform conditioning, regardless of crop thickness. Achieve a new level of conditioning performance with the user-friendly and simple “fine tenability” of Case IH conditioning systems. Fine-tuning the conditioning roll pressure is quick and easy, with no tools required. Spiral rubber-on-rubber conditioning rolls provide thorough crimping and crushing for fast dry down. Provide a scuffing action to the plant stems, removing the waxy outer layer for faster dry down, particularly in grassy crops. They are available on all Case IH disc mower conditioners. Spiral steel-on-steel conditioning rolls offer longer life and provide thorough conditioning, particularly in high-volume or abrasive applications.